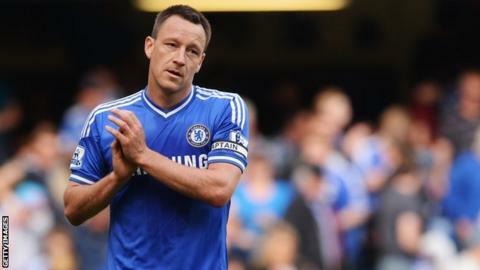 Chelsea captain John Terry has signed a new one-year deal to keep him at Stamford Bridge until 2015. The defender, 33, made his senior debut in 1998, having joined the club as a youth team player from West Ham. Capped 78 times for his country, the former England captain's previous deal was due to expire this summer. Terry thanked the fans and club for their continued support as well as manager Jose Mourinho, who was "instrumental for me the last season". Chelsea chief executive Ron Gourlay added: 'We are very pleased John, who is an undoubted Chelsea legend, will continue to lead the team next season, as he has done for so many years with unrivalled achievement." Terry has made 621 appearances for Chelsea, winning three Premier League titles, five FA Cups, two League Cups, the Champions League and the Europa League. After his debut at the age of 17 as a late substitute in a 4-1 League Cup win over Aston Villa in October 1998, Terry's first Premier League appearance came in December the same year, when he was again a substitute as the Blues beat Southampton 2-0 at The Dell. He went on loan to Nottingham Forest at the end of the 1999-00 season, making six appearances and helping his side keep three clean sheets. He has played 421 Premier League games for Chelsea, scoring 34 goals.